Machine Learning for Business as Unusual. Álvaro Gonzalez and Ignacio Peletier. Álvaro González. Epic Labs AI Lead Engineer. Ignacio Peletier. Epic Labs AI Engineer. In 2004, Chris Anderson presented his article “The Long Tail” in Wired magazine, explaining how the future of digital businesses would focus on a lot of niches in front of mass markets. This is one of the most important things that allows video in the internet era, where each person can search and find content that fits perfectly to their likes, finding it either within the user generated content. And that is exactly where the qualities of artificial intelligence can help. “It is not about doing the same things by replacing people with machines, it is about doing business as unusual, doing something that is not usually done.” Álvaro González. 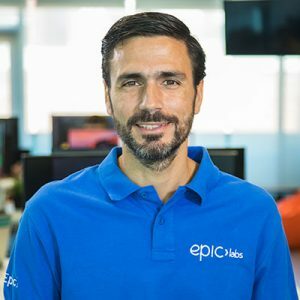 Epic Labs AI Lead Engineer. There is a lot of talk these days about how AI can simplify workflows and perform tasks that are repetitive and automatic to achieve more efficiency. But what if instead of focusing on resource optimization, what we do is think about those things that are not done because there is not enough people or budget for it? It is then when machine learning, video and long tail enable new and interesting use cases that can be undertaken through artificial intelligence tools, either in a 100% automated process or requiring some kind of supervision. In sports, we have the case of those that have a local interest which are minority, or smaller leagues. Thanks to the commoditization of content generation and delivery technologies, it is possible to organize productions operated by artificial intelligence. Focusing on football, a machine learning system can enable a local football match to be made automatically and broadcast it over a streaming channel. You can even train to do replays and include graphics. It is not a question of whether the production is as good as a handful of technicians could have made, it is about having a product where there was nothing before, which among other things, allows monetizing that long tail through dynamic advertising or a unique Sponsorship. This technology can also be applied to recognize and cross-reference material to create content. As we continue to talk about football, this can be applied in parallel to the cameras on the air to all those that are being ingested on some server, taking advantage of material that is usually discarded because no staff is available to review and classify it. In this way, new content can be created, looking for this niche once again, as can be a summary of everything a player has done in a football match, at the choice of the user.